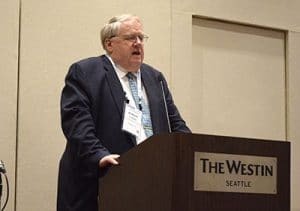 The Federal Railroad Administration (FRA) will have some major shoes to fill with the April 13, 2019, retirement of Robert “Bob” Lauby, the agency’s chief safety officer. Lauby had served in that capacity for FRA since September 2013. He was a frequent presenter at SMART Transportation Division regional meetings and worked to provide regulatory oversight for rail safety in the United States while overseeing the development and enforcement of safety regulations and programs related to the rail industry. “Serving as the associate administrator for Railroad Safety and FRA’s chief safety officer is one of the highlights of my career,” Lauby said. “The job has been both challenging and fulfilling. Lauby had a hand in several regulatory safety efforts at FRA such as Positive Train Control, conductor certification, training requirements, drug and alcohol testing for maintenance of way employees, roadway worker protection, passenger equipment standards, system safety and others. Other safety oversight improvements happened as a result of major accidents. Some of the major ones included crude-oil accidents at Lac Megantic, Ontario, Canada; Mount Carbon, W.Va.; and other locations; commuter train accidents at Spuyten Duyvil and Valhalla, N.Y.; and Amtrak passenger train accidents in Philadelphia and Chester, Pa.; Dupont, Wash.; and Cayce, S.C.
Lauby said that he treasured any interaction he could have with members of rail labor as these helped to broaden his perspective about whom he was working to protect. “I always took time to talk to the SMART TD membership to get their complaints, opinions, and perspectives on the latest industry issues,” Lauby said. “I often left enlightened or with a new perspective. In his more-than-40-year career, Lauby’s railroad and transit experience included safety, security, accident investigation, project management, project engineering, manufacturing and vehicle maintenance. He joined the FRA in August 2009 as staff director of its newly established Passenger Rail Division in the agency’s Office of Safety and was later promoted to deputy associate administrator for regulatory and legislative operations at FRA. One of his responsibilities in that role was to oversee the Rail Safety Advisory Committee (RSAC). Prior to his time at FRA, Lauby was director of the National Transportation Safety Board’s Office of Railroad Safety, overseeing hundreds of rail accident investigations for NTSB and coordinating with our union’s Transportation Safety Team in many investigations. He was NTSB’s representative on RSAC. Lauby addressed SMART TD members in a workshop at the 2018 Seattle, Washington, regional meeting. “At our regional meetings, I would introduce Bob and tell the troops that Bob was the big gun and can handle all the tough questions, which he always did,” Risch said at a party celebrating Lauby’s retirement in late March. Lauby said he took his multiple presentations at TD regional meetings, including at the Seattle regional meeting last July, seriously — he felt he owed it to the attendees to give them useful information. But the benefits from his visits and interactions went both ways, he said, and showing up at the meetings gave him a fresh perspective on the industry. “I always enjoyed speaking to the SMART TD membership – both at the Regional Meetings and when they were on their jobs,” Lauby said. “Whenever I traveled by train, I tried to spend time with the train crew or ride the head end to find out the issues of the day. Lauby’s departure is leaving a vacancy that FRA will have a difficult time filling, Risch said. “No one will really fill your shoes because there is no one with the knowledge and experience to do that,” he told Lauby at his retirement party. “You committed your working life to rail safety, you have been a good friend of mine and a good friend to railroad workers everywhere. Lauby said his career leaves him with a sense of gratitude.